The Crew Dragon capsule built by Hawthorne-based SpaceX docked with the International Space Station Sunday following its launch from Cape Canaveral in Florida. “We can confirm hard capture is complete,” flight officials announced at 3:02 a.m. California time. The announcement came 27 hours after the Crew Dragon launched from NASA’s Kennedy Space Center in Cape. It marks an historic first for a commercially built and operated spacecraft designed to accommodate a crew, NASA officials said. The “successful launch marks a new chapter in American excellence, getting us closer to once again flying American astronauts on American rockets from American soil,” NASA Administrator Jim Bridenstine said after Saturday’s launch. The Crew Dragon, a stepped-up version of SpaceX’s Dragon spacecraft used to carry cargo to the Space Station, launched at 11:50 p.m. California time Friday, propelled by a Falcon 9 rocket. The Crew Dragon mission is unmanned, testing the new ship’s capabilities and ability to self-dock at the ISS. Cargo-carrying Dragon capsules are usually captured by the Space Station’s robotic arms and brought into the docking bay. The Crew Dragon is designed to dock and un-dock on its own. A manned spaceflight has not been launched on U.S. soil since 2011 with the final flight of the Space Shuttle Atlantis. NASA has awarded SpaceX and Boeing Co $6.8 billion to build competing rocket and capsule systems to launch astronauts into orbit from American soil for the first time since then, according to Reuters, which adds that plans call for rockets built by both companies to carry astronauts into space. 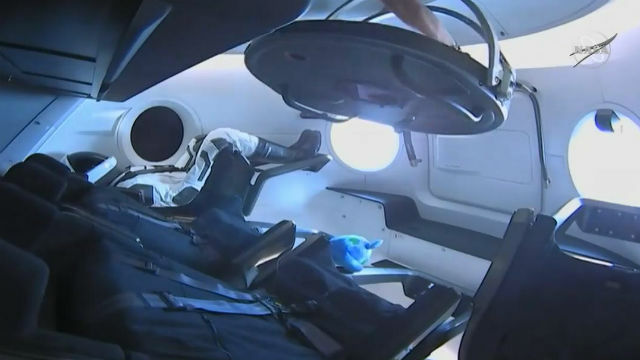 The Crew Dragon is carrying a sensor-laden mannequin, outfitted in a SpaceX spacesuit, along with about 400 pounds of supplies and equipment. The ship will remain docked at the station through Friday when it is expected to undock and re-enter the Earth’s atmosphere with a splash in the Atlantic Ocean. Assuming the test flight goes well, SpaceX is scheduled to actually launch astronauts into space for a short demonstration flight this summer, possibly in July. NASA has already chosen astronauts Robert Behnken and Doug Hurley for the historic mission.